Cloud Server: Also referred as a server that can be exploited for providing computing resources. 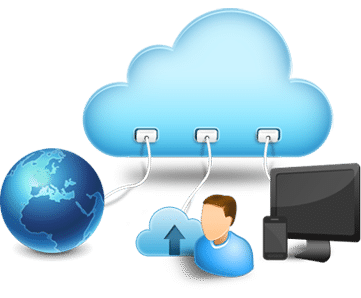 Basically, servers are connected together to provide a single source of computing – a place for cloud services to get their resources. Infrastructure-as-a-Service (IaaS): Includes gathered physical cloud servers and networking resources. They are provided with relevant resources like RAM, disk space, bandwidth, processing power pinched from underlying collaborative cloud servers instead of providing users a unique physical server. All such platforms can be configured and used for the installation of software, platforms, and frameworks etc, required for delivering IT services and develop software applications. Platform-as-a-Service (PaaS) : Includes the virtual software platforms that use network resources and collaborate with cloud servers. These services offer the pooled physical resources of IaaS together with the software bundles over a virtualized world, whereby the user gets a preconfigured platform that can be used to create new IT applications. Software-as-a-Service (SaaS): Includes cloud-based applications delivered using collaborative computing resources. This is often referred to as the most familiar epitome of cloud computing, as it includes cloud storage, gamified solutions, web-based e-mails – provided as a service. Such applications are web-based and can be operated over cloud so that end-users can access them through internet without having to download software. Reliability: Investment on cloud services is worth it – you can work stress-free knowing your data is safe with cloud storage, even when disaster hits. Scalability: Business requirements keep on changing, more often extending, and here, cloud plays quite well as it grows with your needs. In simple words, the size of cloud has a direct relationship with your requirements. Cost-efficiency: Cloud-based applications come with customizable features; pricing packages exist as you will need to pay only for the features integrated in your service package. Easy deployment: Gone are the days when you need to worry about hardware requirements and appropriate software applications. In fact, you can access cloud-based applications from anywhere, at anytime you want to.